Plasma spheroidization uses high energy plasma to produce cleaner, highly spherical and dense metallic powders with greater flow ability. LPW Technology reports that its plasma spheroidization equipment is now operational and can produce higher quality metal powders for use in the additive manufacturing (AM) industry. According to the company, the plasma spheroidization equipmentis the only one in the world used for additive manufacturing metal powder. Plasma apheroidization uses high energy plasma to produce cleaner, highly spherical and dense metallic powders with no satellites, which increases the flowability and packing density of the powder, reducing downtime on the machine and speeding up the manufacturing process. This is especially true for AM machines where finer powder can be required. 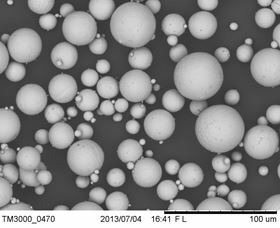 In addition, levels of surface contamination, compared to conventional gas-atomised powders, are reduced, LPW claims. This could improve the mechanical properties of the finished AM component. The company is already producing tantalum, tungsten, and titanium alloys, including Ti-6Al-4V, and plans to produce further refractory metals such as molybdenum and miobium, and ultra-clean nickel based superalloys. LPW is also researching the recycling of powders after several uses on an AM machine, in instances where the oxygen content has increased and is no longer in specification. LPW plans to test the received powder, blend multiple batches and re-size if necessary, before fully analyzing and certifying the powder after plasma spheroidization. The company is seeking beta-test customers with whom to trial this approach.